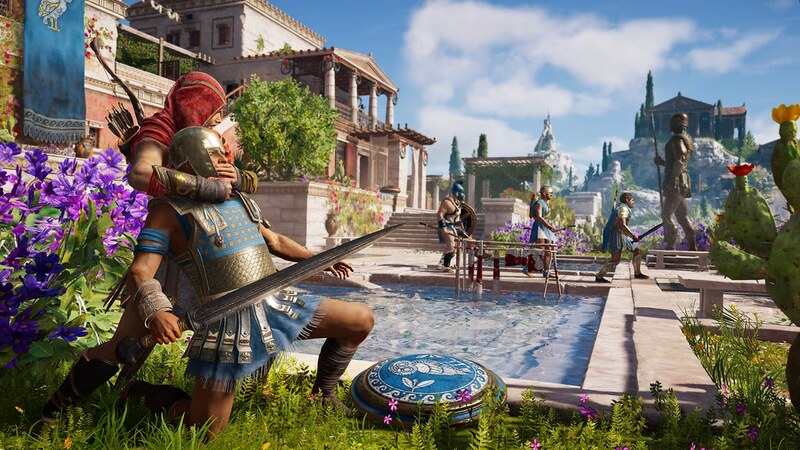 Assassin's Creed Odyssey takes a bigger step back in time than any other game in the series, bringing players to Ancient Greece in the 5th century BCE, centuries before the founding of the Assassin's Brotherhood in Egypt. Launching October 5 on Xbox One, PS4, and PC, Odyssey casts players as one of two Spartan outcasts-turned-mercenaries – Alexios or Kassandra – free to forge their own destiny during the Peloponnesian War, thanks to a big emphasis on player choice. Ancient Greece is a huge open world – nearly half of which is water – and features a strikingly diverse landscape of mountains, cities, forests, and beaches. With that in mind, Odyssey also brings back open-world naval gameplay, putting you at the helm of a trireme warship and setting you loose to hunt pirates and other threats with a steadfast crew of archers. You'll be able to not only customize your ship, but recruit unique crewmembers as well, persuading allies and enemies alike to add their perks and abilities to your roster. You'll also be able to dive under the waves at any time, discovering undersea ruins and battling sharks as you explore. Assassin's Creed Odyssey arrives on Xbox One, PS4, and PC on October 5, and will feature enhancements for Xbox One X and PS4 Pro. • Become a Legendary Spartan Hero: Embark on your journey from humble beginnings to living legend as Alexios or Kassandra. Customize your gear, upgrade your abilities, and personalize your ship on your path to becoming a Spartan hero. • Ancient Greece Awaits: From the heights of snowy mountain peaks to the depths of the Aegean Sea, explore an entire country full of untamed environments and cities at the peak of Greece’s Golden Age. Unexpected encounters will breathe life into your story as you meet colorful characters, battle vicious mercenaries, and more. • Choose Your Own Path: Your decisions shape the world around you with over 30 hours of choice dialogue and multiple game endings. Experience a living, dynamic world that constantly evolves and reacts to your every decision. • Fight Epic Battles: Show off your extraordinary warrior abilities and shift the tides of battle during one of the deadliest conflicts of the time, the Peloponnesian War. Charge into epic clashes between Sparta and Athens in big battles pitting 150v150 soldiers against each other. • Sail Across the Aegean Sea: Find uncharted locations, uncover hidden treasures, or fight your way through entire fleets in naval battles. Customize the look of your ship, upgrade weaponry to suit your strengths, and recruit crewmembers with unique perks, tailoring naval combat to your style. • A Land of Myths and Legends: Discover a world rich with myths and legends. From ancient rituals to famed statues, come face to face with Greece’s legendary figures and discover the true nature of mythological beasts like Medusa and the Minotaur.